Let Bertucci’s give you a taste of real Italian cuisine right in your own backyard. Our dough, made from scratch every day, exclusive tomatoes, and roasted vegetables are always perfectly fresh, no matter when you decide to dine in. Whether you place an order for our beloved pizza, authentic pasta dishes, or just-sweet-enough desserts, we conjure up a little bit of magic in every meal we serve at our North Andover, MA location. Although our menu is extensive, our signature brick oven pizzas are what keep many families coming back time after time for years. We offer a wide range of toppings and have perfected our dough recipe, so it has the perfect flavor and texture every time. The brick oven where our pizzas are baked has long served as the heart of our restaurant. Just as the kitchen is the center of the home, it is the center of Bertucci’s. Every time you join us for a meal, we hope you feel at-home and like you are truly part of our extended family. 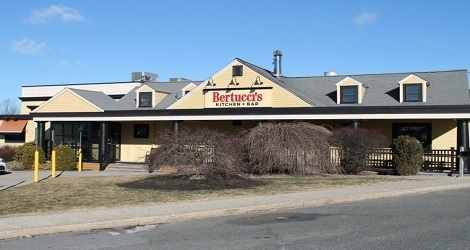 Minutes from Merrimack College, Eaglewood Shops and Stevens-Coolidge Place, Bertucci’s is the go-to spot for North Andover residents and guests alike. If you’re throwing a special gathering, call our team for top-notch catering. Choose from our delectable entrées, one of a kind pizzas, calzones and so much more.